Record turnout on first day of early voting in Clark County: Good for GOP or Dems? 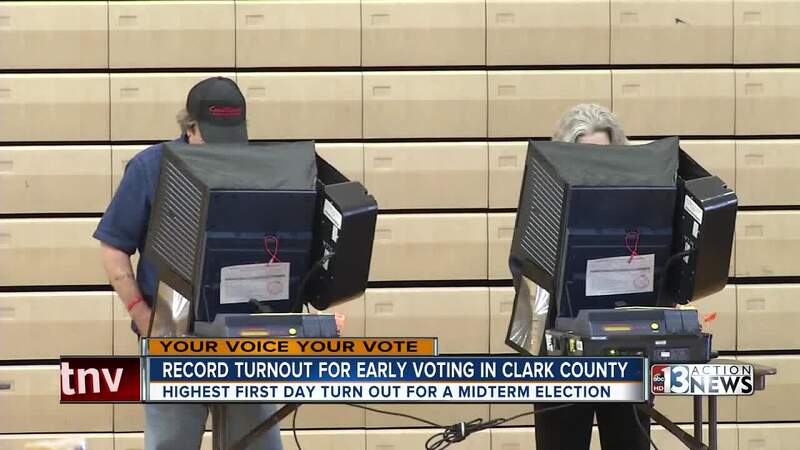 Clark County saw a record turnout on the first day of early voting for a midterm election. On Saturday, more than 30,000 people came out to cast their ballot. That's the highest first-day turnout ever for a midterm election. As early voting continued Sunday, county officials said they're still seeing a good number of people coming out to vote. More than 54,000 people casted a ballot by the time the first weekend of early voting concluded. At the Centennial Center polling site, voters had different reasons why they decided to cast their ballot early. "There are not any lines and you can get in and get out quickly," Betty Mauer said. "We were anticipating a large turnout because of several conditions that are going on in our country," Frank Schiavone said. Political analyst and editor of Nevada Independent Jon Ralston said the current tense political climate is part of the reason why we saw a record turnout for early voting. But what does this mean for Democrats and Republicans? "The first day was a big day for the Democrats, not just in Clark County where they won by 4,000 votes but also in Washoe County where Reno is a Republican county," Ralston said. "Democrats had a smashing turnout too. that's very ominous news for Republicans but again it's just one day." Experts said it is too early to tell which party benefited from the record-breaking turnout. The second day of early voting was shaping up to be a good day in terms of bringing people to the polls. Clark County's registrar of voters Joe Gloria said part of the reason for the outstanding numbers: there are no more assigned polling places. As voters can now go to any vote center. "The access that they're provided on election day now. it doesn't matter if they're at work, at lunch or doing some shopping on election day there are plenty of locations available to them," said Gloria. A complete list and schedule of early voting sites are available here .